Aquascape's remote-mount photocell turns your transformer on at dusk and off when ambient light appears. Aquascape's newest component is ideal for use with the complete lineup of Aquascape LED lighting. Make your pond or garden lighting simple and easy with the Aquascape Garden and Pond 12-Volt Photocell with Digital Timer. 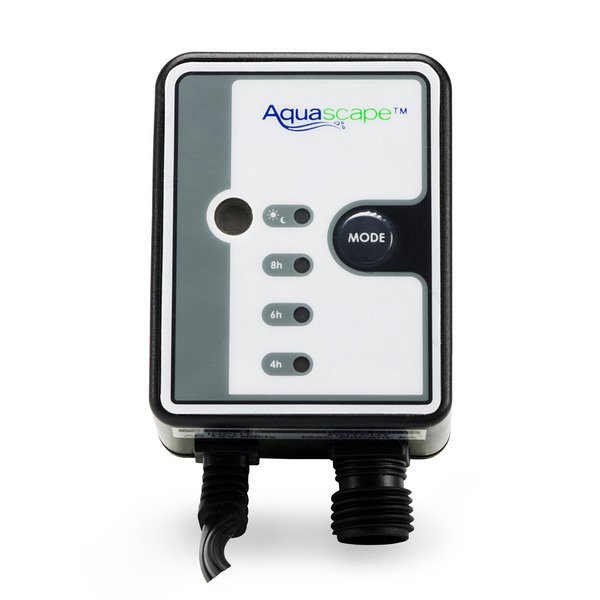 Easily integrated with other 12-Volt quick-connect components, the Aquasape Photocell manages your garden and pond lighting by turning the lights on and off at desired times. Repeating a programmed schedule daily, the timer has a built-in memory function, reverting back to the most recent programmed schedule in case of power loss. Either select the photocell to automatically turn on at dusk and off at dawn, or choose one of the three timer options. Timer options include 4-hour, 6-hour, and 8-hour settings, providing a wide variety of options for your personal lighting needs. The Aquascape Garden and Pond Photocell is able to be used in a variety of applications due to its 60-Watt capacity and 36-inch power cord, and it is backed by a limited 5-Year Full Replacement Warranty. Includes 3 feet of cord and works well with Aquascape Quick plug-in compatible manual transformers. Connector can be cut off and hardwired into other types of 12 VAC low voltage lighting systems. Maximum rating of 60 watts of lights can be controlled by this unit. Only accepts male Quick Connector on light input side. Note: If you need a single male quick connector with approximate 12" lead, click on "add (1) Quick Connector" above. This connector will allow you to use the photocell in any hard-wire installation. From Randall Jones of Morrisville, Pennsylvania on 4/16/2014 . 7/3/2018 – I need this unit to work with a 12 old battery to turn LED lights on my trailer for like six hours a night has anybody tried . . .
11/18/2016 – Is this device waterproof? Can it be used outdoors? 3/21/2012 – Can the 12 vac photocell be wired in to a 12 volt car battery and then on the other end be connected to a 7 watt landscape . . .